How Do Thylakoids Work to Suppress Appetite? You may have likely heard of some of the amazing benefits of this spice called Turmeric. But what really is it? Turmeric is a spice that comes from the Curcuma plant. The rhizome or root has a brown peel; however it is bright orange to yellow inside. Belonging to the ginger family, turmeric has been used in India and the Middle East for thousands of years. One of the most highly-prized spices in the world, it has a peppery flavor and adds unique taste to foods. The name “turmeric” is derived from the Persian word for “saffron,” the neon yellow-orange hue used to make curry and yellow mustard. A domesticated plant rather than wild, India remains one of the most prominent producers, along with Indonesia, the Philippines, China, Taiwan, Jamaica, and Haiti. Traditionally called “Indian saffron” because of its deep yellow color, turmeric has been used throughout history as a condiment, textile dye, and health remedy with a revered place in the Ayurvedic pharmacopeia, a comprehensive holistic health care list that dates back to 500 B.C. What are the Nutritional Benefits of Turmeric? Using the fresh root provides the maximum health benefits. Using it fresh, it can be cut up, grated, juiced, or crushed through a garlic press. Dried turmeric is an orangey powder. When using the fresh root in recipes, one tablespoon is equivalent to one teaspoon of the dried for taste. Caution should be used as this can stain counter tops and clothing. This is one of the basic ingredients in curry and is a much used spice in Indian and Asian cooking. It is can be added to salad dressings or sprinkled on salads. It also adds flavor and color to vegetables, sauces, and dips used with raw vegetables, any kind of chips, or sauces. Be sure to choose the full, organic turmeric spice rather than a curry blend, which has a very little amount of anything healthful. When using it in recipes that require cooking, you can add some before the cooking process, and then grate some of the fresh on top of the meal before eating. Research has shown that combining onions and turmeric (that is, combining quercitin and curcumin) is beneficial in reducing precancerous lesions in the intestinal tract. As well, the combination of turmeric and a phytochemical found in cruciferous vegetables, such as cauliflower, packs a powerful healthful punch. Unfortunately this tremendous spice is not absorbed very well on its own. To dramatically increase its benefit to you, it needs to be thoughtfully combined with other foods. This spice is fat soluble so mixing it with fat greatly aids in the body’s absorption. Mix it with olive oil or organic virgin coconut oil. For the biggest absorption boost, adding black pepper increases curcumin’s potency by many times; some claims are by 1000 times. 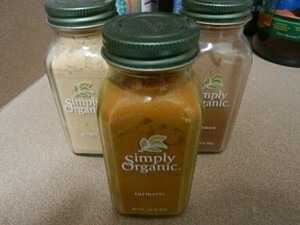 Or sprinkle some on an avocado or blend it into coconut and avocado for delicious smoothies. 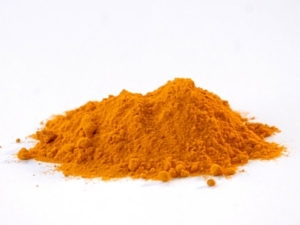 Basic nutritional aspects of turmeric include a daily value in manganese and in iron. It’s also an excellent source of fiber, vitamin B6, potassium, and healthy amounts of vitamin C and magnesium. Although one tablespoon does provide excellent nutrients, the fact is that it is effective even in much smaller quantities. The claimed health benefits include an improved ability to digest fats, to reduce gas and bloating, to decrease congestion, and to improve skin conditions, such as eczema, psoriasis, and acne. Turmeric has been used as a powerful anti-inflammatory in Chinese and Indian medicine for thousands of years. Ancient medicinal uses began when it was noted as an anti-inflammatory agent and then to treat a wide variety of conditions, such as jaundice, menstrual problems, blood in the urine, hemorrhaging, toothaches, bruises, chest pain, stomach or intestinal gas, and colic. The active ingredient of turmeric is curcumin, which is a powerful anti-inflammatory and antioxidant with numerous medicinal uses. It contributes to the general health of our body in many ways. There are also many claims that it can treat or prevent some more serious health issues, including possibly inflammatory bowel diseases, rheumatoid arthritis, cystic fibrosis, and diabetes. Curcumin, the primary agent in this spice, contains proven effects in this area that are comparable to over-the-counter anti-inflammatory agents as well as some prescription medications. But curcumin doesn’t produce the toxic effect that synthetic drugs sometimes do, such as ulcer formation, internal bleeding, and even a lowered white blood cell count. More reported health benefits include relief from joint pain, such as rheumatoid arthritis, reduced joint swelling, and greater range of motion when used regularly. It’s another case of the spice making the list of Power Foods which acts like a prescription medication, but with fewer symptomatic downsides. Research also suggests that turmeric may be on the list of possible benefits in treating inflammatory bowel diseases, lowering cholesterol counts, protecting the heart, relieving indigestion, improving liver function, and even preventing Alzheimer’s disease. Extracts of turmeric were found to improve skin hydration that had been damaged by ultraviolet rays, along with possibilities that it could be used for skin protection. Used as an ointment could possibly produce some pain relief in patients with external lesions. So What Should I Remember about Turmeric? Remember the advice of Hippocrates from the 4th century B.C. who believed that we should think of our food as medicine and eat with that in mind. This bright yellow spice, traditionally used as food and medicine, contains potent antioxidants and benefits that studies have shown can support many health issues. To get the most benefit from turmeric, use it to enhance many of those “ho-hum” dishes on your table, such as fish dishes or any meat for that matter. It can add a delicious and interesting taste to mashed dishes like potatoes or cauliflower, sautés with onions, broccoli, carrots, or bell peppers. It can be used as a base for creamy vegetable dips, sauces, and egg salad. This tremendous spice should be a top consideration for anyone truly interested in improving the level of their health and moving towards optimal health. It also adds a level of protection against many possible health issues. This spice is one of our top choices to add to any diet and is one of the best foods you can consume.